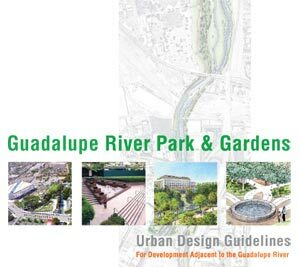 The Guadalupe River Park & Gardens Design Guidelines were adopted by the San Jose Redevelopment Agency Board and San Jose City Council on October 7, 2003. The Guadalupe River Park holds a special place within downtown San Jose. A natural demarcation meandering along the edge of downtown, it establishes a vital pedestrian corridor, allocates scarce open space, and visually connects the urban core with the Arena and Diridon districts. It is a natural asset with the potential for creating a richer urban environment. It offers serene nature within steps of the urban pulse of a major American city. Click here to see the whole report, 3.6 MB .pdf file.